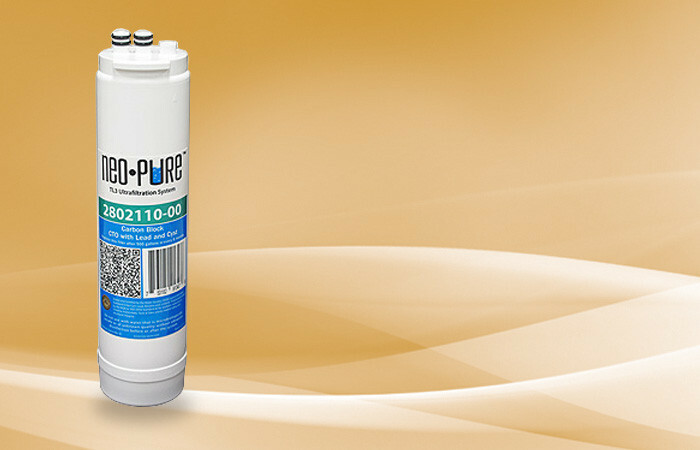 The Neo-Pure Carbon Block Filter, part number 2802110-00, is used in the Neo-Pure TL3 Ultrafiltration System. The TL3 system is tested and certified by WQA to NSF/ANSI Standard 53 for cysts, lead, atrazine and lindane; and Standard 42 for aesthetic reduction of particulates, chlorine taste and odor, as well as for material safety and structural integrity. Reduces Chlorine Taste and Odor, Lead, and Cysts | 2-1/2″ x 10″ | 0.5 Micron | The Neo-Pure Carbon Block Filter, part number 2802110-00, is used in the Neo-Pure TL3 Ultrafiltration System. The TL3 system is tested and certified by WQA to NSF/ANSI Standard 53 for cysts, lead, atrazine and lindane; and Standard 42 for aesthetic reduction of particulates, chlorine taste and odor, as well as for material safety and structural integrity. The Neo-Pure Carbon Block Filter features an eco-friendly coconut shell carbon block.